Nowadays Tim Horton is better known for coffee and donuts. But before the Tim Hortons restaurant chain exploded in popularity throughout Canada, Tim Horton was already a household name in his country. Tim Horton was the ultimate defenseman in his time, and one of the greatest to ever play in the National Hockey League. An excellent skater, Tim had good rushing ability and a powerful slap shot. But he was better known for his defensive play where his physical strength and intelligent play made him a joy to watch for 24 seasons. One of the truly classy gentlemen ever to play the game, Horton starred with the Toronto Maple Leafs for 18 years before stints with New York Rangers, Pittsburgh and Buffalo. Tragically his career and life were cut short following an car accident in 1974. Miles Gilbert Horton was born on January 12, 1930 in Cochrane, Ontario. He was named after each of his grandfathers, but when Horton's mother found out that his first name was going to be Miles, she quickly renamed him Tim as she wished for in the first place. So even though legally there was no "Tim" Horton, that has been his name since almost the beginning. Tim started playing hockey at the age of 5 in Duparquet, Quebec, where the family briefly relocated. After a couple of years the Hortons returned to Cochrane, and Tim continued to play hockey there until he was about 15, when the family moved to Sudbury. After the move to Sudbury Tim began playing for the Copper Cliff Redmen of the Northern Ontario Hockey Association (1946-47). In the 1947-48 season, Tim moved on to the esteemed St. Michael's College Majors on a scholarship. St. Mikes was an integral part of the Toronto Maple Leaf farm system, and he was placed on the Leaf's reserve list in 1947. In September 1949, Tim dropped out of school before gaining his diploma and began to play hockey professionally. Conn Smythe, the army general behind the Maple Leafs success, offered Tim a three year contract to play with the Pittsburgh Hornets, the Leaf's American League farm club. It was in Pittsburgh that Tim met his future wife, Lori. By 1952 Tim began his rookie season with the Toronto Maple Leafs. He would be the number one man on the Toronto blue line for the next 17 years. And what a 17 years it was. Horton, along with fellow defensemen like Allan Stanley, Bob Baun and Carl Brewer, lead the defensive minded Maple Leafs to 4 Stanley Cups in the 1960s. In that time Horton became the first Leaf to play in 1000 games. 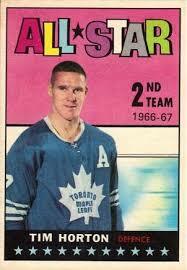 He was also selected to the All-Star Team six times while with the Leafs. Surprisingly. he never won the Norris Trophy as the league's best defenseman, as he was overshadowed by the likes of Pierre Pilote and later in his career Bobby Orr. Although he never won the top award for defensemen, listening to the game's top players talk about him makes him sound like the best thing since sliced bread. Gordie Howe, hockey's most physical hockey hero, called Horton "hockey's strongest man." Bobby Hull, who many consider to be the strongest player to have ever played, once said "Few players brought more dedication or brought more honor to the game. He was my idea of a super pro." Goalie Jacques Plante said that Horton had "probably the toughest slap shot in the league." So good was Horton that a Russian hockey coach in 1964 claimed that Horton was the most fantastic hockey player he had ever seen. Montreal Canadiens tough guy John Ferguson said "Horton's the hardest body-checker I've ever come up against. He's as strong as an ox and hits with terrific force." Indeed Horton was strong, despite being relatively small at just 5'10" and 180 pounds. He was so strong that he was known as a policeman on the ice, although not in the fashion that Ferguson was noted for. Instead of dropping his gloves and pounding a poor opposition member into next week, Tim was famous for using the "Horton Bear Hug." Whenever there was trouble, Tim would enter the melee and wrap his tree-trunk-like arms around a troublemaker and firmly squeeze the helpless opponent until everything had calmed down. Jim Schoenfeld, a Horton protégé in Buffalo and a standout defenseman in his own right, is very fond of Horton for helping him along as a youngster. "I always remember him saying 'Jimmy, the hard way is the easy way,' because he felt practicing the difficult things made it easier under game conditions. He was right. It's a guideline I still follow to this day." Teammate Frank Mahovlich perhaps sums Tim Horton up best: "I never knew a player so steady. No flash, no polish, all hard work." Feeling that his career was near its end in the spring of 1970, the Leafs traded Horton to the New York Rangers for Denis Dupere. A little more than a year later he was left unprotected by the Rangers in a special League draft as he had officially announced his retirement. Regardless, the Pittsburgh Penguins drafted him, and he eventually signed with Pittsburgh and played for them until half a season before he was picked up in a similar draft by the Buffalo Sabres in June of 1972. Despite his advanced age, Horton was the backbone of a young Sabres team. He played almost 2 full seasons with Buffalo before tragedy struck. In what was likely his final season as a professional hockey player, Horton suffered serious injuries after his car crashed as he was heading home after a game in Toronto on February 21, 1974. Horton had an agreement with the Sabres that he would stay with his family in Toronto that evening and would return to nearby Buffalo early in the morning. Unfortunately he never made it as his car crashed near St. Catherines, Onatrio. Seven days later he died. Tim Horton played in 1446 regular season games in which he scored 115 goals and had 403 assists for a total of 518 points. He also played in 126 play-off games scoring 11 goals and 39 assists for 50 points. At the time of his death Tim was already well established in his coffee and donut chain. He had 35 stores at the time of his death, although that is small potatoes compared to what it is today. Today's famous restaurants however have no affiliation with Tim or his family (note the name of the restaurant is 'Tim Hortons,' not 'Tim Horton's'). His wife sold the company in the late 1970s for one million dollars in a controversial transaction that she later regretted and tried to overturn. how much would an original maple leaf gardens issue with tim horton featured on it i think the year 1968?? what is it value?? Any idea what the value of a Leafs, Tim Horton #7, 1966-67 team signed stick (15 signatures), is worth. Thanks. Some of your story is innacurate. He died I think in St. Catherines. But I think the game was played in Buffalo earlier that night. Not in Toronto but against Toronto. Also if I remember right I think he died instantly his car was a crumbled mess . Tiny white porsche. And one thing everone leaves out is that they never tested his body for alcohol because it was believed a hit to the head by a puck in the toronto game was the cause. He hit the guard rail on the St. Catherine bridge at over 100 miles per hour. the truth of his death is that he died at the site of the crash as his funeral was on Feb 25th; was not the St.Catherines bridge but one of the street overpass bridges. Tim died at the scene of the accident as he was thrown approximately 160 feet from his car, which was a white Ford Pantera not a Porsche. He had played earlier IN Toronto and was not hit in the head during that game but had taken a puck to the face in an earlier practice. Fact is, Mr. Horton had twice the legal limit for alcohol in his system and was being pursued by police at the time of his untimely death. Watched the game on Hockey Night in Canada played in Toronto. Tim was one of the three stars of the game. Leafs won. Never heard about alcohol level but do recall reports he was taking pain killers for a suspected broken jaw suffered in previous game. Tim died atragic death too young! I have very fond memories of my wonderful next door neighbour Tim Horton. He was driving a Pantera. He did die at the scene. My father was taken to the scene by the police, to identify the body. He did have a broken cheek bone and was on pain killers. His final game was in Toronto. It was painfully sad for his family, me and my family. He was generous, honest, kind and humble, in my eyes. Kids from the neighbourhood would come to an outdoor skating rink that my father made in our backyard, hoping Tim would come out and play. They were often delighted, as he enjoyed playing with the kids and would appear frequently. I remember him as a gentleman and I was told about his famous bear hug!! So, the important parts of this post matches up with my childhood memories. Thanks!